I want to use them on everything. 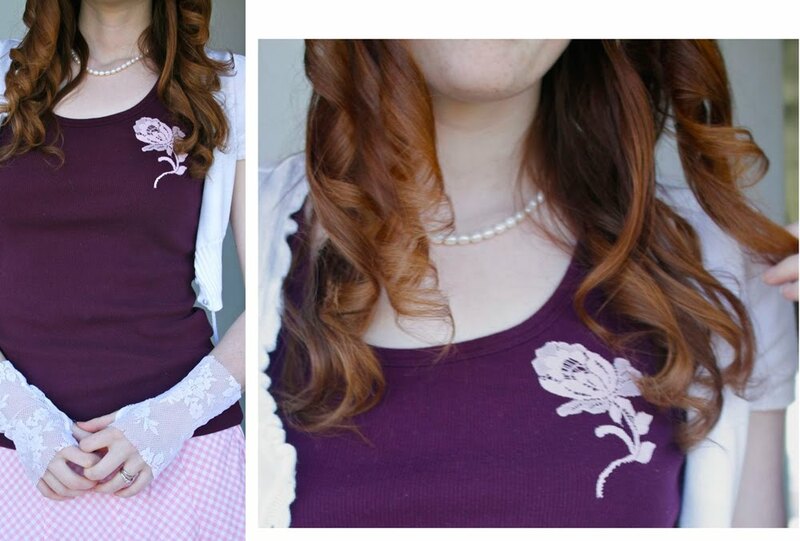 And I was thinking about it the other day, why not use the lace you have to make appliqués? So I dug around in my stash, and found several options, and started snipping away, cutting out the flower shapes! 1) Cut out a square of Heat Bond, and a square of lace, large enough to cut around your flower. 2) Lay the lace face down, with the Heat Bond on top of it, paper side up. Press for 2 seconds on medium heat. 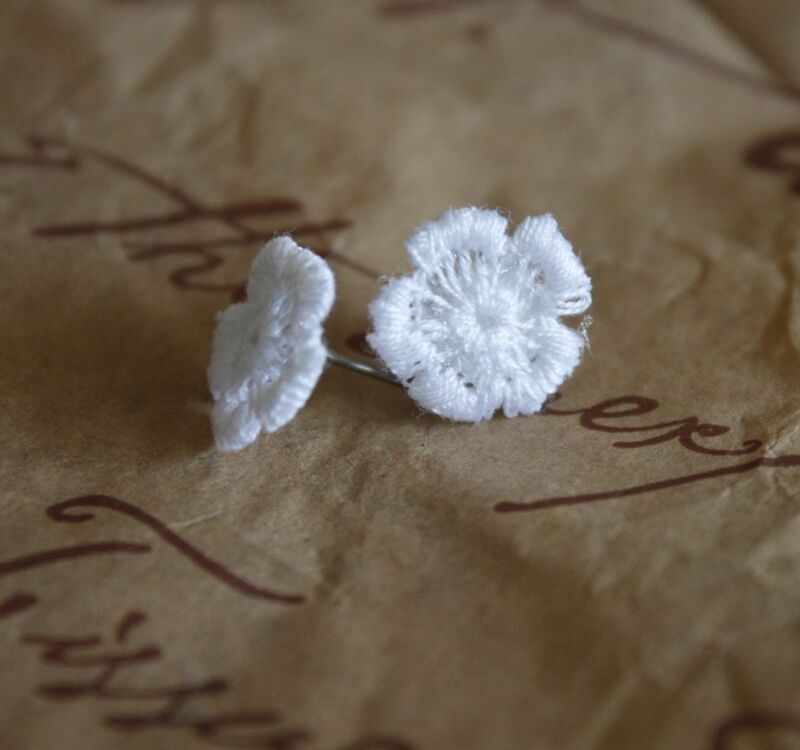 3) Cut around your flower shape, and then peel off the paper backing. 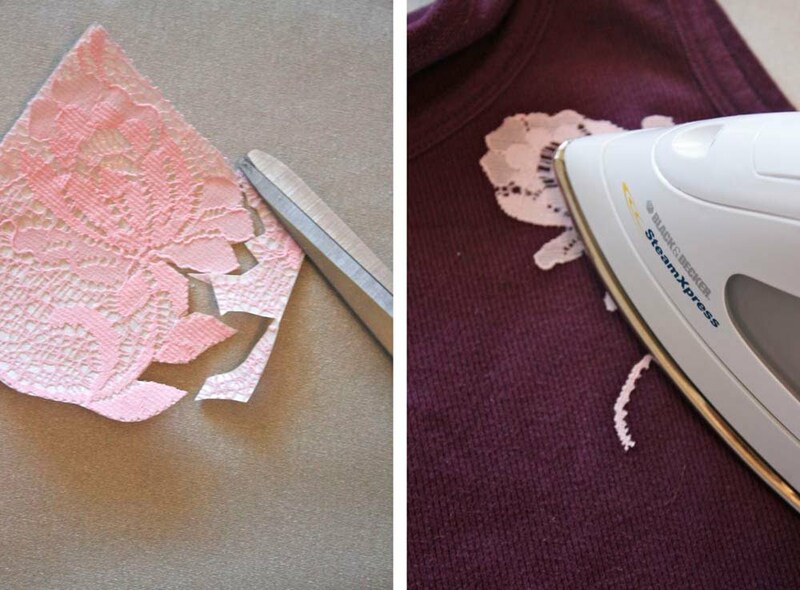 4) Lay the appliqué on your shirt, and press for 8-10 seconds. That's all the directions call for, but I also like to give it a few hand stitches for security. I love the possibilities of this! And don't forget-you can paint them, too! I spray painted these, but for clothing you could use fabric paint, or dye! I just love this discovery, because a yard of lace would give you sooo many appliqués! But if you only needed a few, you could just buy a couple of inches of lace, and it would be really inexpensive. So Sweet! I am going to have to do this one today! You have the best ideas! Love the many uses you came up with for just one motif!! Isn't it grand to be "cheap"?? LOL Thanks! The shirt turned out so pretty. I love the idea. I did that on the train of my wedding dress. Of course that was 100 years ago and the dress is now yellowish. Your post brought back some wonderful memories. I always enjoy reading your posts. THanks so much. What a clever idea, I love the hair clips and the earrings of course. I think I might try the hair clip one for my daughter. Thank you for sharing. 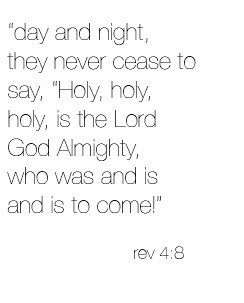 Have a blessed weekend. Beautiful! What a lovely idea. I especially love the necklaces. Great work! I have all this over the top lace sitting here and I never knew what I could do with it, I LOVE your creativity! Incredible! I'm really excited about this. Thanks for a great tutorial! Those look so beatiful! And you look beautiful as well! Great ideas, Disney! Paige is the cutest child ever!! amazing again!!! You are just too creative! Give me some of it!!! You always have the best ideas! I love this one! Love them! Love those little earrings! Love these! So many great ideas! Where to begin? I want to try each of these. Off to buy some lace! As always, thanks for sharing such beautiful ideas! Try car spray paint - I have found it gives great results! What a great idea! 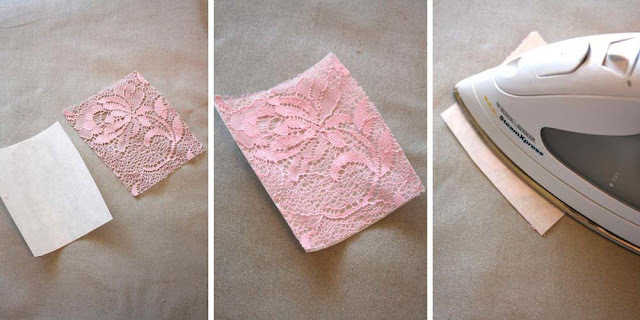 I've been trying to figure out what to do with the remnants of lace I have lying around and this is perfect :) I'll let you know how it turns out! Beautiful! So simple and sweet! oh gosh, I love the tank! I'm going to have to do that for sure! LOVE this idea! I also love the fingerless lace gloves you're wearing in the picture! I might have to give them a DIY try soon. YOU ARE SO AMAZING! I can't tell you how much of an inspiration you are. I visit your blog EVERY day. I am just starting my blog and was wondering if you would do a visitor tutorial on my blog to help me get things rolling! I love love love Paige's hairclips!! Such a stunning model too! As soon as my little one has grown enough hair to wear them I'm definitely going to have a go! Beautiful ideas! I, too, love lace appliques and use them on ballet tutus and as embellishments for other projects. I have drooled over lace fabrics many times! 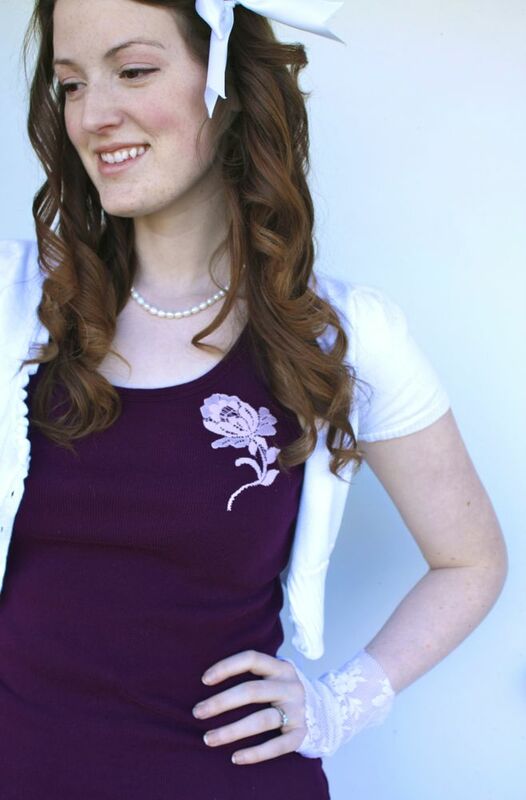 I am fortunate enough to own an embroidery machine so I now make the appliques myself. This is a great help for getting the size and color I need for a specific project and very economical (after buying the machine!!!!). I submitted a picture for the ruffle contest with lace appliques that I made - it is the picture of my granddaughter in an aqua and white tutu which has been posted on the blog. Thank you for your inspiration, Disney! This is such a lovely idea, plus I love your hair!! Great idea!! Love the tank!!! What a good idea! I love the first picture.. your hair is amazing! That's lovely. I just bought a little pile of lace, so I can experiment a bit with this. Thanks for the idea! Love the pictures, your hair is so pretty! SO. GORGEOUS. like all of your creations! I am so featuring this!! What a great idea! I'd love to share a link to this on sewwhattoday.blogspot.com on March 28! 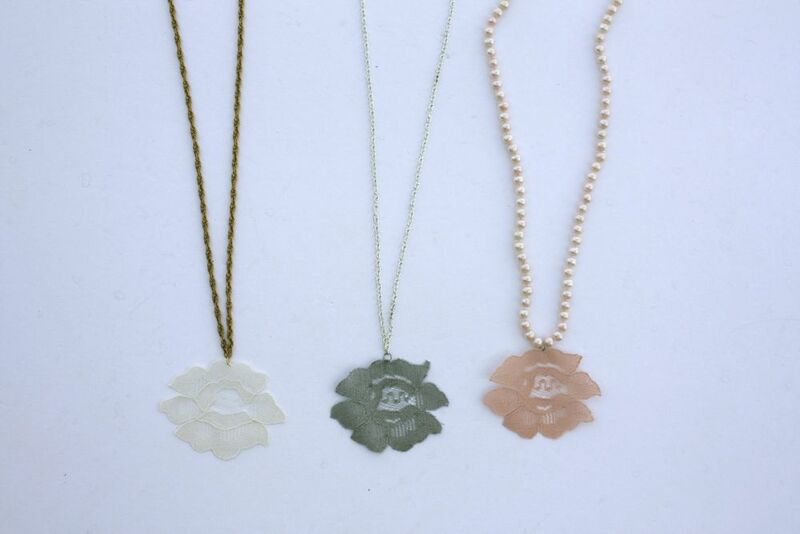 Absolutely love the necklaces! SO cool! Stevie Nicks inspired clothing, jewelry and accessory line. They are so beautiful. Thanks for sharing. Love that idea, so simple (which is good for the craftly novice like me LOL) and so adorable!! Do you think this would work with freezer paper? Just a thought...maybe I will try it out. that's so pretty, i love the lace very much ! As soon as I read this I had to try it and I LOVE it!!! Great idea! I especially like the spray paint idea. So many possibilities. I love the necklaces! Such a cute idea! Fantastic idea! Thank you for sharing it! You always have the best ideas!!! I have some old lace curtains that have seen better days! I'm hoping the flowers are small enough? You are sooo talented I haven't even got the words for it. I've given you a "sunshine award" on my blog : http://churchsexy.blogspot.com/2010/03/sunshine.html. I know you've gotten several before so please don't feel like you need to do it again! I've also linked to your Ruffle your stuff contest and your jersey skirt tute. Thanks for your inspiration! I've decided to nominate you with the Kreative Blogger award. You can find it on my blog http://tylerhandmade.blogspot.com/ and all you have to do to accept it is share 7 things about yourself we don't know, and pass it on to 7 more blogs you like. I've got a bra that could use a little TLC. 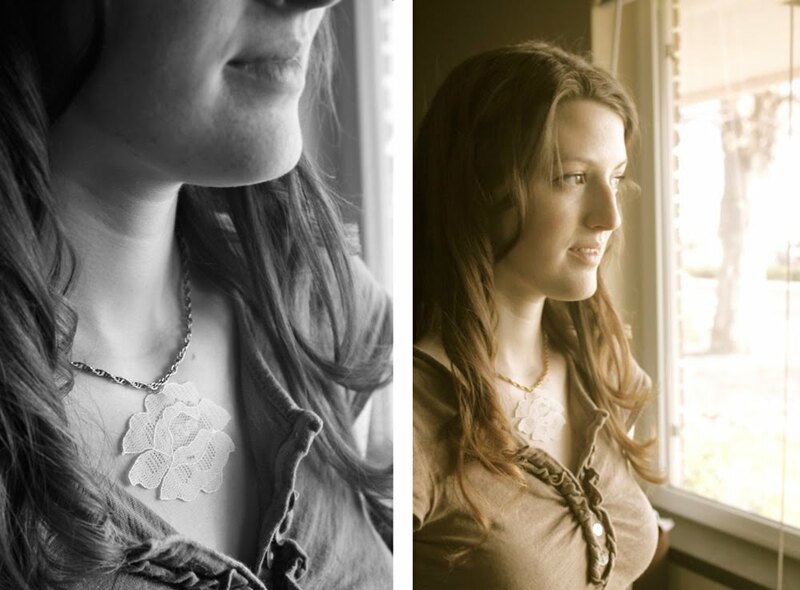 This lace "trick" would make it a little less drab and a little more fab! Thanks for the inspiration! Love this!! So easy and fun and a quick update to a plain shirt. I love your blog. Sometimes I think that you are in side my crafty mind. Every time I think of how to do something you always have it here. I Love, Love, Love Your Blog!!!! i love this idea so very much!! i want to go out and buy same lace right now! Stunning, and BRILLIANT!!! I love it, on my to do list for sure. I have some GREAT lace just waiting for something fabulous like this. Thanks for the great idea. LOVE THIS! I have a huge stash of vintage lace and curtain panels, I have used bits and pieces in my crafting, but never with heat and bond, this is a great idea! 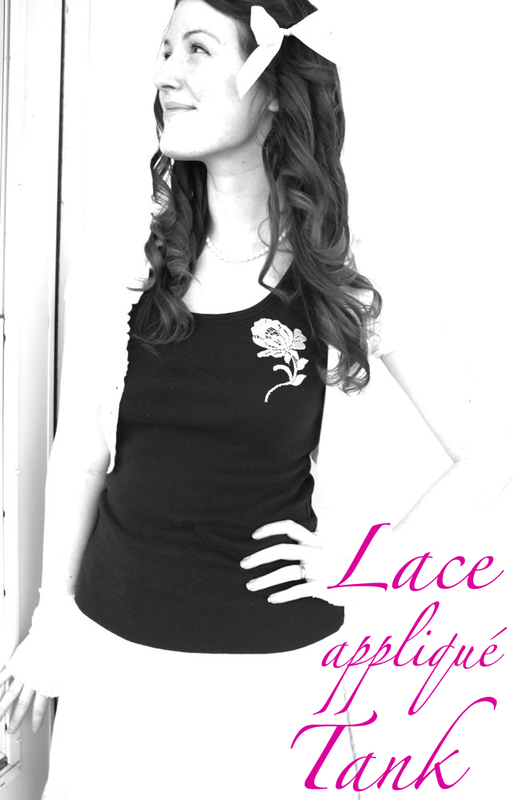 Watch lace proliferate all over the blogosphere! Thanks for the great stuff! Love it! And I'm jealous of your gorgeous hair! I totally love this beautiful, yet simple idea! Thanks! Greeeaat :) Can hardly wait! These are gorgeous!! Thanks for the post!! You have forever changed the way I look at ruffles! Please check out my blog for a little bit of sunshine I've sent your way! Wonderful idea, I can't wait to give it a try. This is so great. Thanks so much for the ideas, I really like the shirt and hairclip!! LOVE those gloves you're wearing in this! Aww, that is so pretty! Thanks for the great idea, I'll be linking. I'm doing something similar tonight. I remembered seeing this, and wanted to thank you for posting the tutorial. :) It helped! I just finished a cute li'l red onsie for my 10 month old girl...with yellow/goldish lace flowers....LOVE! 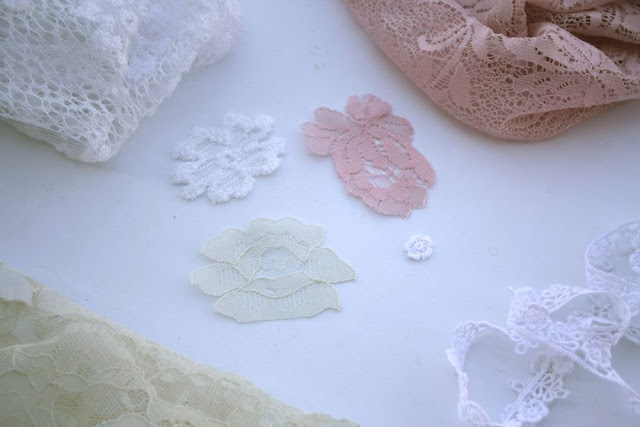 I'm creating a headband out of bridal lace...and could not find any Briadal appliques in any of the stores near me. Thank you for posting the tutorial because I was pretty sure I could use the lace I had with bonding..and now I KNOW I can! You've given me some new ideas, too! :o) Thank you.